Baraldi, A. N. and C. K. Enders (2010). An introduction to modern missing data analyses. Journal of School Psycholology 48(1): 5-37.
van Buuren, S. (2012). Flexible Imputation of Missing data. New York, Chapman & Hall/CRC. Collins, L. M., J. L. Schafer, et al. (2001). A comparison of inclusive and restrictive strategies in modern missing data procedures. Psychological Methods 6(4): 330-351. Eekhout, I., R. M. de Boer, et al. (2012). Missing data: a systematic review of how they are reported and handled. Epidemiology 23(5): 729-732. Eekhout, I., H. C. W. d. Vet, et al. (2014). Missing data in a multi-item instrument were best handled by multiple imputation at the item score level. Journal of Clinical Epidemiology, 67﻿(3), 335-42. Enders, C. K. (2010). Applied Missing Data Analysis. New York, NY, The Guilford Press. values. Rehabilitation Psychology, 56(4), 267-288.
growth curve analyses. Psychol Methods, 16(1), 1-16. Fox-Wasylyshyn, S. M. and M. M. El-Masri (2005). Handling missing data in self-report measures. Res.Nurs.Health. 28(6): 488-495.
van Ginkel, J. R., K. Sijtsma, et al. (2010). Incidence of missing item scores in personality measurement, and simple item-score imputation. Methodology 6(1): 17-30. Little, R. J. and D. B. Rubin (2002). Statistical Analysis with Missing Data. Hoboken, NJ, John Wiley & Sons. Molenberghs, G., Thijs, H., Kenward, M. G., & Verbeke, G. (2003). Sensitivity Analysis of Continuous Incomplete Longitudinal Outcomes. Statistica Neerlandica, 57(1), 112-135. Roth, P. L. (1994). Missing data: A conceptual review for applied psychologists. Personnel Psychology 47(3): 537-560. Rubin, D. B. (1976). Inference and missing data. Biometrika 63(3): 581-592. Rubin, D. B. (1987). Multiple Imputation for Nonresponse in Surveys. New York, J. Wiley & Sons. Schafer, J. L. (1997). Analysis of Incomplete Multivariate Data. London, UK, Chapman & Hall. Wood, A. M., I. R. White, et al. (2004). 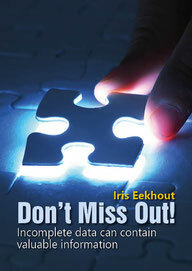 Are missing outcome data adequately handled? A review of published randomized controlled trials in major medical journals. Clinical Trials 1(4): 368-376.